Towards the end of last summer, Kara — a UBC graduate student — was struggling desperately to make ends meet. Kara usually juggled multiple part-time jobs, but said employment opportunities dried up during the summer. Her main employer had made a mistake in processing her payroll, delaying her paycheque by a month. Her partner was on a full-time work placement, but his position was unpaid. She had to pay rent. She had maxed out her credit card. Hungry and unable to afford even close-to-expired produces, Kara, whose name has been changed to protect her privacy, turned to the AMS Food Bank — a service she never thought she would have to use. Kara’s struggle shows that food insecurity — defined broadly as unreliable access to sufficiently nutritious food — impacts students in deeper ways than being forced to eat cup ramen. It is also far from rare. 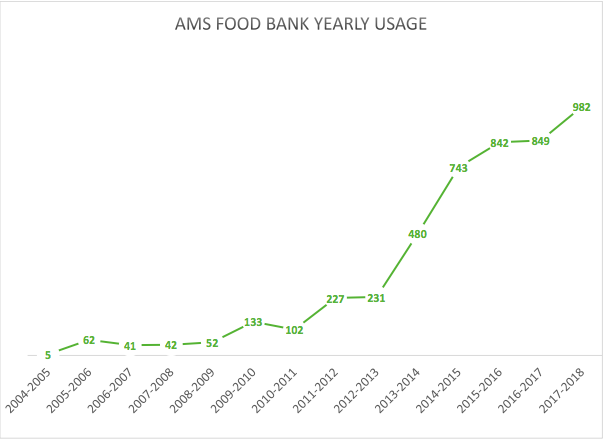 First opened in 2005, the AMS Food Bank — an emergency food relief service that allows any person with UBC student identification up to six visits per term — has grown year-over-year. The service saw 751 visits in the first nine months of 2018 and “one of the craziest summers” in its history, according to Coordinator Simran Sidhu. “Usually we have quite low usage in the summer just because most students are not on the campus — but this year, we definitely saw the highest number we’ve ever seen,” she said. In July this year, 54 students visited the bank in comparison to 56 in July 2017. But AMS Student Services Manager Piers Fleming pointed out that the Food Bank — which is open only on Mondays and Wednesdays from 10 a.m. to 4 p.m. — had to close on three days that month because they fell on public holidays. He said July 2018 could have seen as high as 120 visits, an increase of over 200 per cent from last year’s number. Sidhu and Fleming attributed the upward trend to the high cost of living in Vancouver — a city infamous for its housing costs — and increased awareness about the Food Bank on campus. “We don’t want to make people feel like they are being [pushed] to come to the service … so the only way we can reach the population of those who are food insecure is to reach everybody,” said Sidhu. She said the service sets up a booth at events like Imagine Day and in central locations like the Nest to reach students. There have also been numerous food drive events in partnership with campus groups, such as UBC Library’s Food for Fines during which each donated item took $2 off the student’s library fines. “We have more events and we’re partnering with groups on campus, which in turn they’re also advertising the Food Bank more. So just through sheer exposure, more people are knowing about it,” said Fleming. On a campus with around 56,000 students, data on the AMS Food Bank’s usage indicates that food insecurity affects just over 1.7 per cent of UBC students each year. But that is probably not true. “[It] is likely a significant underestimate of the number of students who are finding it difficult to feed themselves properly,” said Dr. Graham Riches, professor emeritus and director of the UBC School of Social Work between 1998 and 2008. Data from a 2017 UBC Social Ecological Economic Development Studies (SEEDS) study, which surveyed UBC’s land and food systems (LFS) undergraduate students, supports his claim. Just over four per cent of respondents reported having accessed emergency food programs, while at least ten per cent say they had gone hungry because they couldn’t afford food. One reason for this gap could be the existing lack of awareness about the Food Bank amongst groups on campus, despite the AMS Services’ ongoing effort to raise its profile. “I’m a pretty social person and have a wide network — and I’d say that every single person I’ve told that we have a food bank, not one of them knew that we did,” said Blake Smith, a PhD candidate in arts education and another former Food Bank client. Smith added that she found it difficult to locate the service, which was then housed in the basement of the old Student Union Building (SUB), because of its “discrete signages.” Kara remembers having to ask another club for directions to the Food Bank, which was then on the Nest’s second floor due to the SUB re-construction, on her first visit. Since then, the service has moved to the Life Building’s basement, tucked around an isolated corner. But Smith and Kara also recognized the desire for privacy, as they described the stigma that exists around accessing food banks — another reason that the data might be skewed. “There’s a sense of shame and guilt initially because I kept thinking, ‘What more could I have done,’ or ‘What did I do wrong,’ or, ‘What happened?’” said Kara. “At first, I was embarrassed, I felt shame, I felt inadequate,” Smith echoed, noting how she used to flip the Food Bank bags inside out. She added that some might decide not to go because they feel its resources should be reserved for those struggling more than them. “It’s the stigma of welfare because ... society is saying that you should stand on your own two feet, you should pull yourselves up by your own bootstraps,” he explained. After their visits though, Kara and Smith both expressed gratitude toward the Food Bank and its staff, adding that the service helped empower them. “It helped me a lot because it made me feel dignified in a way, like I deserve to eat a proper meal … When I came home with all the groceries, I just felt so grateful and really happy,” said Kara who is now “doing fairly well” with multiple jobs and a bursary from UBC, in the application for which she mentioned having had to access the Food Bank. It’s not a coincidence that both Food Bank clients who spoke to The Ubyssey are graduate students. Graduate students are “disproportionately more affected” by food insecurity, according to Fleming. A 2018 SEEDS study found the most frequent users of the AMS Food Bank to be off-campus graduate students who are also supporting dependents. The study also found that international students and students who live on-campus are overrepresented in food bank client demographics. The first two trends mirror Smith’s own experiences. When visiting the Food Bank, the PhD candidate was working multiple jobs but faced gaps between paycheques during academic term turnovers. At the time she had just moved from the United States and knew no one in Vancouver except her two dogs. All these factors were then exacerbated by the high costs of studying and living in Vancouver. Only 9 per cent of graduate respondents to a Graduate Student Society survey reported feeling satisfied with the cost of living and only 34 per cent with their funding. Following her and others’ experiences with financial struggles, Smith said she decided to include information about the Food Bank in graduate student orientation presentations. “I came to a point where I decided there’s not shame around [accessing the Food Bank] — it’s just a point in your life and your experience when you needed a little help,” she said. Looking below the surface, food insecurity among university students emerges as even more of a staggering issue. Dr. Candice Rideout, the LFS senior instructor on the 2017 SEEDS study, explained this problem can range from mild food insecurity — or being anxious about affording food — all the way to severe insecurity, which means actually going hungry because one lacks access to food. According to the study, 35 per cent of LFS undergraduate students had experienced mildly or moderately food insecure and 10 per cent were in the severe category. Those who are severely food insecure are not only more likely to have health problems, but also face impacts on their academic performance and wellbeing. Rideout also cautioned against dismissing the milder forms of food insecurity. “Anxiety about [food insecurity] is still super significant — especially when students already have an ongoing stress load about the many competing demands in their life,” she said. The 2018 AMS Academic Experience Survey found that 17 per cent of undergraduate and graduate students expressed monthly concerns about running out of money to buy food in the past year, putting them in the mild category. These figures jump to 37 per cent of undergraduate students and 42 per cent of graduate students for those who expressed this concern at least once in the 12 months. “I’d say it probably did surprise me that [the number] was as high as it is,” Rideout said about the total figure of food insecurity from the SEEDs study. 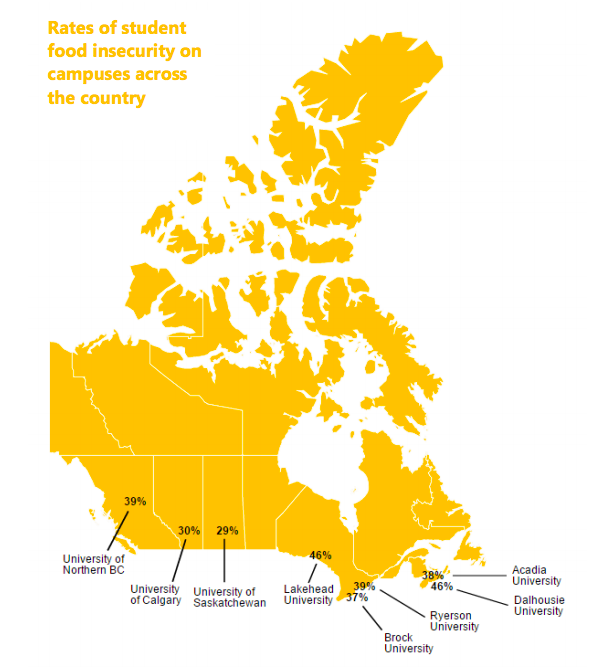 In particular, a 2016 report by Meal Exchange — a non-profit organization that supports student’s food security initiatives — showcases this common trend across Canada with their survey of five universities: Dalhousie, Brock, Lakehead, the University of Calgary and Ryerson. Like at UBC, around two in five students at these universities are food insecure. The breakdown between moderate and severe food insecurity is also similar, with 30.7 per cent of students surveyed faced milder forms of insecurity, while 8.3 per cent have experienced severe insecurity. The self-reported reasons contributing to food insecurity are also alike: tuition fees, housing costs and food costs. Almost half of respondents said they have had to forgo healthy food to pay for rent, tuition and textbooks. Since there is only a patchwork of data on this issue at UBC, the university’s food nutrition working group is now supporting a SEEDS project to map the baseline of food insecurity not just for students, but also staff and faculty. According to Melissa Baker, manager of nutrition and wellbeing at UBC Student Housing and Hospitality Services, the scholar on the project is currently conducting a literature review to determine the specific questions and a methodology for the baseline survey. The survey will then be sent out early in the next academic year, and Baker expects data to be compiled and analyzed by the end of the next fall semester. “... We are trying to get a very UBC-specific number, but I’d be surprised if it was much different than around 40 per cent,” she said, referencing data from Rideout’s SEEDS study and the Meal Exchange report. Ultimately, what these statistics amount to is that the prevalence of food insecurity amongst university students is three to five times higher than it is among the general population. Calling this trend “quite common,” Rideout speculated the reason to be about income. Aside from the fact that some are not supported by their parents, university students are also limited in how much they can work while attending school and the jobs they can get without a degree. They are also bombarded by both living expenses and university-related ones, like tuition, books and supplementary fees. “It’s basically just all around the income ratio to expense ratio,” she said. But even with numerous data pointing to the urgency of this issue, could we ever find the root of the food insecurity iceberg if some students make ends meet by creating future financial insecurity? “To what extent can I be considered food secure when I’m purchasing everything with my student loan?” Rideout recalled of one response to her study’s survey.